Let me start out by saying that I have sold my gorilla costume. A gorilla costume has quite a number of uses, and one could make the claim that every gentleman should own a gorilla suit for various reasons. I don't intend to dispute that claim (which is real and totally not just made up by me), but after wearing my own costume to the point that I thought people might start to believe that I had some kind of monkey fetish, I felt that it was time to move on. Since buying my gorilla costume, I've worn it to a Pirates playoff game (who would have thought? ), to a Halloween party, given it to Larry to wear in a Franks and Beans episode, lent it to my dad so he could wear it...and finally, I wore it to Comic-Con. So I had gotten my use out of it, is what I'm saying. For some reason, when I decide on a costume theme, I'm interested in dressing up as a character who is in turn dressed up as something else. And since we were talking about Comic-Con, having an ape dress up as a superhero seemed a natural fit. And so Gorilla Superman was born. In 2013, I took my Frankenberry costume to Comic-Con, only to leave it in its bag to go unworn for the show. This is because...there's a lot to do at Comic-Con. When Sunday rolled around in 2014 and I hadn't yet unveiled Gorilla Superman, I knew it was do or die time. If nothing else, I had to justify the inordinate amount of space this costume took up in my suitcase, so I took it out, put it on, and did a lap around the hall. ...as was the case with this little girl with the Ninja Turtles backpack. She was TERRIFIED of the suit, and her mom pulled her out of line when I got near. Is inadvertently scaring children funny? You can decide. For the most part, I was happy to just get a chance to wear the damn costume before I got rid of it once and for all. The Superman costume was a patchwork job, though not as intensive as the Jet Boy/Jet Girl costumes from 2012. The Superman costume originally came as one piece, which was then cut to show off the gorilla midriff. I bought the two embroidered emblems as the cape did not originally have one, and the chest logo was pretty terrible, and so it was replaced by this more authentic version. The cape was attached with clasps on the neck of the suit. Overall, I was really happy with the way the Superman part of the costume turned out. It was a shame to have to cut it in half. This year at Comic-Con was much hotter than usual. Instead of the normal 72 degrees all day every day, temperatures reached up toward 90 on most days. This led to some uncomfortable moments in line, and even inside, it was almost intolerable inside of a gorilla suit, with a spandex Superman costume over top. This was the main reason that I didn't venture outside while wearing the costume...as it was, I was sweating profusely and more than a little delirious (seriously) when I made the loop back to the small press table. Breathing heavily inside of a gorilla mask is not recommended on the best of days. I ran into a really nice Superman/Lois Lane combo somewhere in the 3000 rows. Superman had a really nice, high quality costume, and to top it all off, he was about 6'3" and barrel chested, so he fit the part pretty well. Lois here told me that she would write about this in the Daily Planet. Apparently the damn foot flap on this thing kept flipping up as I walked. Also, the pants of my suit kept shifting down, but I was able to manage with it for the hour or so that I had the costume on. There probably couldn't have been a better juxtaposition of images at the DC booth than the giant backdrop seen above. Gorilla Superman in front of a billboard-sized image of Superman punching a gorilla. What are the odds? A few feet away from the Superman signage, there was a MAD Magazine display that also seemed apropos. I hadn't planned on getting a picture in front of it (because I was about to die of heat exhaustion), but I was asked by a guy with an expensive camera to take one. It was a weird experience. I mean, part of the reason I wore the costume was to pose for pictures, and I took a good number of them with and for other people along the way. But this guy kept positioning me and re-positioning me. He must have taken two dozen pictures. All this as there were hundreds of other, better costumes in the surrounding area. I had no idea what to do! Obviously, I've got no clue as to what it's like to be ogled like many women in costumes are, but perhaps this gave me a little bit of insight into that ordeal...and it was super creepy. And I was a guy with an ape mask on. This last experience notwithstanding, I'm glad that I was able to get one more session out of ye ole' gorilla suit, before shipping it off to who knows where, where it'll begin a new life. We'll see what further conventions bring, but I'll be happy to take a break from costuming for a while. Oh, and I didn't get as many Beppo comments as you might think. Pittsburgh has lagged behind other cities in terms of comic book conventions in recent years, but maybe that is finally changing. If you haven't heard, Wizard World recently bought the rights to the Pittsburgh Comic-Con, which will be held this September at the David L. Lawrence convention center in downtown Pittsburgh. There are good things and bad things about Wizard taking over, I suppose, and we'll see what the inaugural event brings later in the year. I'm more excited about Pittsburgh's independent comic show, PIX, which takes place this year on Saturday, March 28th. This isn't the first year for the show. I heard about it last year after the registration deadline had passed, so I made sure that I got an early jump on it this year. I'm not quite sure what to expect, but the fact that there is a show dedicated specifically to small press and creator-owned comics is something to be pleased about. The show, which is co-sponsored by the Toonseum, will be held at 10 S. 19th Street in Pittsburgh from 10-5 on Saturday, with programs taking place later that evening, from 7-11pm. Both admission and parking to the event are free! In case you are wondering, yes, this is embarrassing, and yes, I wish I could change it, but I'm not going to mention it because I don't want to bring more attention to myself (...other than writing a blog about it, I guess). 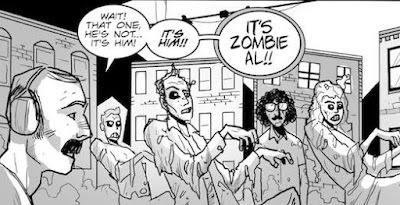 Some other guests include Carolyn Belefski (Magic Bullet), Rafer Roberts (FUBAR, Black Terror) and Don Simpson (Megaton Man). I'll be interested to meet Simpson for the first time, and a bit nervous about bringing up The Tick with him, but I suppose it had to happen some time. For more information on the show and its guests, check out the PIX website at http://pixcomics.blogspot.com. 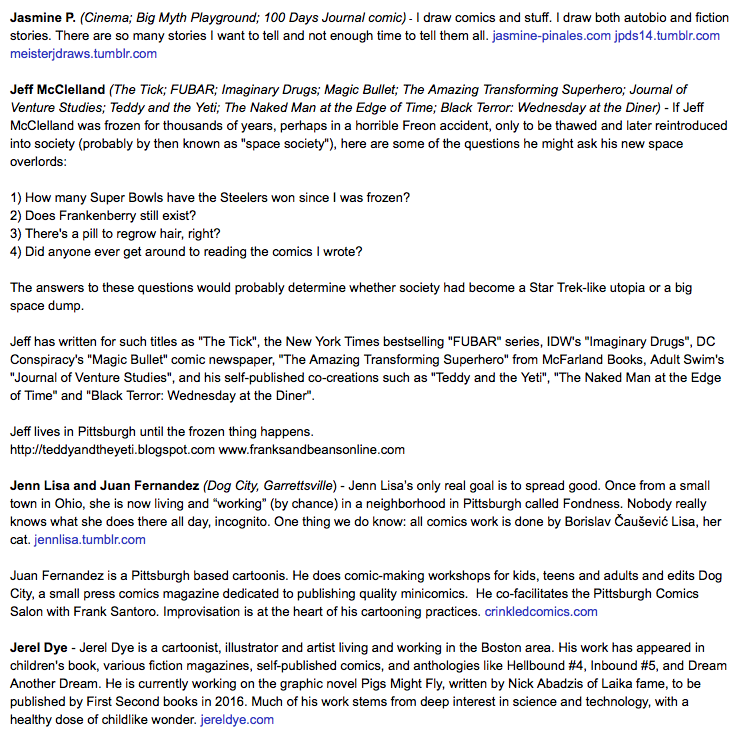 It's great that Pittsburgh finally has a second show dedicated to comics. The city deserves one. Ah, Comic-Con. Where has the time gone? We're closer to the 2015 show than we are the 2014 version, and yet here I am, still showing pictures from last year. What can you do? All of these pictures are from Sunday, the final day of the event, which was, all things considered, fairly low-key but still included a lot of great moments. Here are a few. Parodying the Comic-Con protestors never goes out of style, and sometimes includes horse masks. The handles are, I guess, Instagram accounts, because they don't show up on Twitter. A shame. A big part of Sunday, for me, was spent back at Nerd HQ for their "Conversations for a Cause" series, which, as I've stated before, is pretty incredible. I got tickets (thanks to Larry) for the Nathan Fillion panel. The 2013 version was so much fun that I had to make it back this year for an encore. It was more laid back as I already had a year under my belt. Still, it was fun to see Fillion and Firefly companion Alan Tudyk again in this intimate setting. As always, the very generous Zach Levi introduced the panel guests. Fillion was gracious and funny as always. He mentioned that he sometimes walked the convention floor, dressed in a costume that also covered his face, from time to time. I wonder how many celebrities do something similar. It's not a bad plan for blending in. Firefly will never die, even if Wash did. There were a lot of great items auctioned off this year. I'm amazed at how much people are willing to spend. It's great that all the money goes to Operation Smile, Levi's charity of choice. I'd like to win something one day (one day...). The NerdHQ team handled the photo booth better than they did last year, which included a mad rush after the panel had ended. This year, if you had a ticket to the panel and $20, you could get your picture taken with both Fillion and Tudyk. 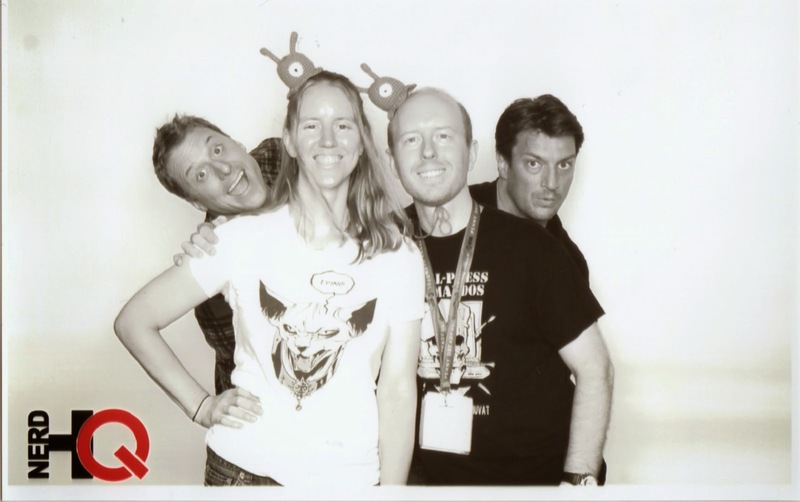 My wife and I are fans of Fillion's well documented photobombs, and so we asked to be included in that storied history. I'd say we got a good one. So we didn't lose our nerd cred, we were also wearing Futurama brain slugs at the time. After the panel and picture session ended, it was time to head back. Do these Pokemon outfits count as onesies? And it was time for another trip across the bridge, which called for yet another picture of the convention center and the city...but this time...it was a panoramic view. How nice. One thing brought about by more events taking place on the back lawn is a longer line to the vaunted Taco Truck. It was a bit distressing...but there was still a fairly short wait to the front of the line, and the Taco Truck is worth every minute spent waiting. Here's the man in charge. I love him. And his burritos. Here's a fairly prescient costume, given the ending of the Guardians of the Galaxy movie. Good on this kid, though I'm surprised that anyone under 30 knows who Howard the Duck is. Let's call this "battle damage Iron Man". A nice job. Another nice job by Aquawoman, unintentionally standing by a Ghostbuster. It's strange to look behind you and see someone dressed like this following you. Kudos to him for taking the picture in stride. Here's a picture that illustrates how everyone feels at the end of a long convention. This gentleman probably had the best costume at Comic-Con. Apocalypse here is affiliated with the Cinema Makeup School, and questions as to if this "counts" as a legitimate fan costume are brought up. I think it counts. Either way, it's a heck of a costume. Catwoman was standing next to Apocalypse. She did a nice job, but that's a tough act to follow. Battle Damage Dr. Mrs. The Monarch. Love the original Trek uniforms. To the side of the Cartoon Books booth stood this life size RASL statue. Really cool. How many times did this guy get described as "outrageous"? Heck, what's one more time? This is not the end. There are still more pictures to show. And show them we will. Soon. 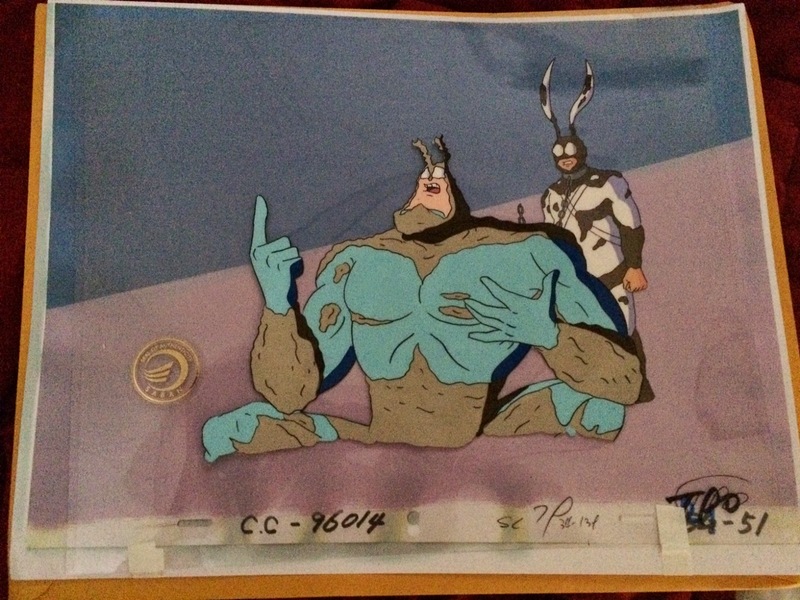 New Tick comic and cartoon art! My Tick collection has grown a bit since...um...since I started writing the book. What can I say? There are a few items I picked up recently that must be shared. First is a page of original art. This splash panel is by Eli Stone, from the much admired "Big Blue Destiny" story. There were a few panels on top that were added at a later date. 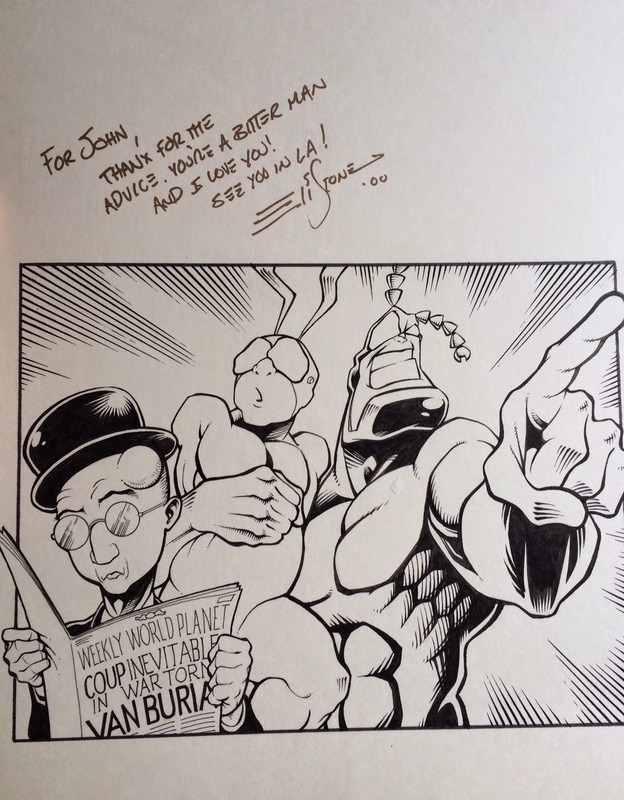 This page is signed and personalized to, perhaps, the guy I bought it from (I'm not sure if that's the case, but I think it is), and it reads, "For John, Thank you for the advice. You're a bitter man and I love you! See you in LA!" Apparently, all Tick creators make their way to southern California eventually. I'd love to meet Eli Stone one day and talk to him about this run on the book. It was weird and wild and, at times, serious. This is a pretty cool item to add to my collection. ...is that it is two cels in one! Arthur is on his own sheet. He's got a chain leading to a metal collar on his neck, if that's not clear. On the top is an authentication sticker from Saban (the production company). Where else can you find a picture of Disney's Maleficent eating concession stand nachos? NOWHERE ELSE. That's another sign that it's time for yet another batch of Comic-Con 2014 pictures! Seriously, I still have more of them. These photos take us all the way to the end of Saturday, after my wonderful encounter with "Weird Al" Yankovic earlier in the day that I wrote so much about. As Saturday drew to a close inside the convention hall, I stopped at the New England Comics booth once again. 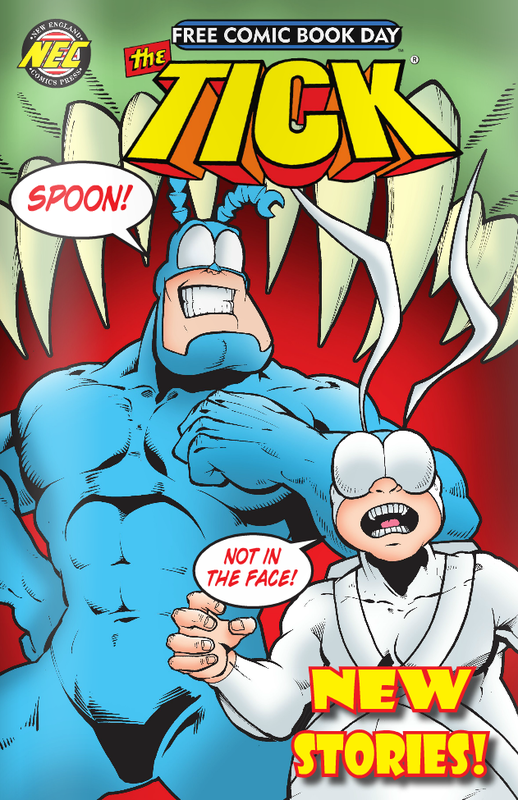 I was able to chat with Ben Edlund a bit and learn some news that has since been revealed to the general public: that The Tick was returning to the small screen, as a pilot episode has been ordered for Amazon's streaming original content service. The news broke shortly after the convention, but it was honestly difficult to keep it in after finding out about it. But I kept my mouth shut (I promise). I was able to get this nicely framed picture with Ben, Supernatural's Jenny Klein and Ben's very talented daughter. Jenny obliged with the duck face. My love for the convention affects my judgment, for sure, but I think that San Diego is such a beautiful city. Here's a requisite bridge shot as the sun sets. The people by the tents are leaving the convention, not, I hope, lining up for Sunday morning. But you never know. I went over to the Interactive Zone next, where I found these great Spaceballs cosplayers. The Adult Swim Fun House, so great in 2013, was back for another round in '14. This time, there was a domed Meat Wad experience to see. They ticketed these events and handed out wrist bands, which was probably a bit more organized than the 'get in line and hope' approach taken the year before. In any case, here's a shot of the inside of the dome, before we got back in line for the Fun House. We waited in line for quite a while, because even though tickets were given out for specific time frames, a whole crowd of VIP ticket holders (I believe they won these tickets by spinning the giant prize wheel Adult Swim had inside the convention hall) cut in line in front of us poor schlubs who only had regular tickets. Luckily, there was a dancing Mooninite there to entertain us. The Fun House was almost the same as it was in 2014. I don't blame Adult Swim for not mixing it up, because if you pay for a giant, inflatable fun house such as this, you might as well get some use out of it. And the new dome was a nice addition as well. I found a few different passageways this time around that I missed in 2013, and I was able to go down the giant slide at the end, too, so it was pretty fun. Oh, and I met Santa! He gave me a Black Jesus candle. Thanks, Santa. Would you believe that I have more Comic-Con pictures to share? Of course you do, because I mentioned it just a little bit ago. Sunday is coming up. Get ready.